Gas and Electricity prices continue to rise, and we’re all getting increasingly hacked off with increasing fuel bills. Why then, have six out of ten of us not yet switched to a better fuel deal? According to a report from OfGem, over half of the UK hasn’t ever changed to a different provider – meaning that consumers are paying £4.1 billion per year more than they need to. Shopping around for a better deal is pretty easy, and it’s not as much hassle as people think, but people still seem reluctant to use a service such as uSwitch to make savings on their home fuel. The plan is a simple one… Which? 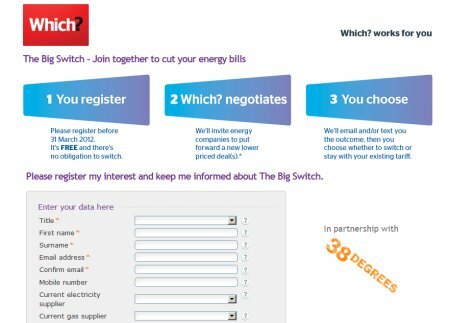 is asking everyone not happy with their energy bills to sign up, for free, at whichbigswitch.co.uk. Which? will negotiate with the big players in the UK energy market, and try to secure the best deal that they can for those that have signed up. There’s no obligation for anyone to sign up to whatever deal it is that Which can come up with, but if it’s a good deal, everyone (except the energy companies) win. Registration with The Big Switch is open from today until the 31st of March, and signup takes 30 seconds. 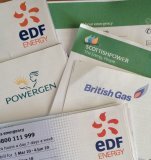 No need to have your electricity or gas bill to hand – they just want your name, email address and the names of your current supplier. Once you’ve registered, you’ll get an email confirming that you’ll hear more from Which? shortly: “Once we have more information about the deal, we’ll be able to provide you with a personalised savings estimate. It’s then up to you whether you decide to go ahead and complete the switch or stick with your current deal”. Sounds like a plan to us. Collective bargaining has worked in other countries, and it could just work here too, so you owe it to yourselves to give it a go. Posted in EnergyElectricity, Fuel bills, Gas, The Big Switch, which? I can not register, as I do not have a mobile phone.